Sit back and relax with this slick and sophisticated upholstered chair. Resting on top of high tapered legs, this impressive piece emits a contemporary appeal with its clean lines and slim track arms. A more cozy charm is given off by the blind tufted back. Additionally, the upholstered seat and back cushions provide both support and comfort as you are sitting and relaxing. Bring this sought after mid-century modern style to your living room with this upholstered chair. The Beech Mid-Century Modern Chair with Tufted Back by Palliser at Reeds Furniture in the Los Angeles, Thousand Oaks, Simi Valley, Agoura Hills, Woodland Hills, California area. Product availability may vary. Contact us for the most current availability on this product. Fabric Options Available in a wide variety of leathers and fabrics by special order. Pricing and availability may vary. 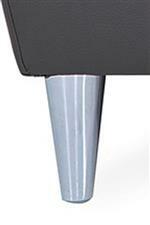 Leg or Skirt High tapered legs available in either espresso wood or bright chrome metal. Frame Construction Hardwood, softwood and engineered wood products; all joints pinned & glued for uniformity & strength. Seat Support Interwoven 100% premium elastic webbing. Padding & Ergonomics High resilience seat foam for superior durability and comfort. Warranty Lifetime warranty on wood frames, motion/sleeper mechanisms. 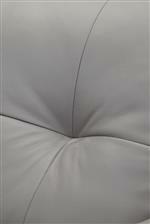 5-year warranty on materials & workmanship, leather, cushions. 2-year warranty on metal frames, electrical components, chair mechanisms, sleeper mattresses. 1-year warranty on fabric, vinyl. The living room is the most important place in a home, so naturally, it is deserving of stylish and comfortable furniture. With every piece featuring high tapered legs, slim track arms, and detailed top stitching, this collection combines these contemporary elements with a charming coziness displayed by the tufted backs. Furthermore, the upholstered seat and back cushions provide long lasting comfort. Treat yourself and transform your living room for the better with this mid-century modern collection. The Beech collection is a great option if you are looking for Mid-Century Modern furniture in the Los Angeles, Thousand Oaks, Simi Valley, Agoura Hills, Woodland Hills, California area. Browse other items in the Beech collection from Reeds Furniture in the Los Angeles, Thousand Oaks, Simi Valley, Agoura Hills, Woodland Hills, California area.